At Ofqual’s recent employer event we spoke about the regulated qualifications landscape and what we’re doing to help people navigate it. We have now updated some of the charts we used at that event to include data for 2017. 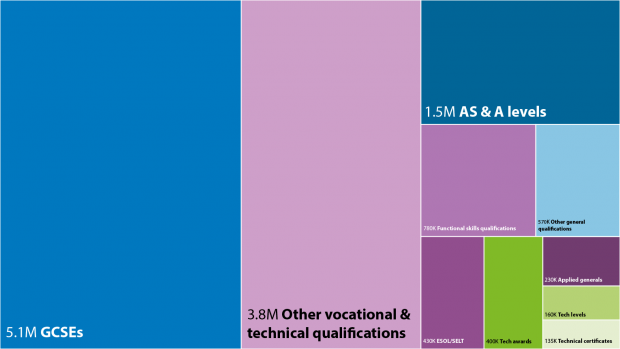 Chart 1 below shows that about half of the total certifications of regulated qualifications awarded in the academic year 2016 to 17 were vocational or technical; there is an explanation of the categorisation further down this blog. However, chart 2 shows how many thousands of different vocational and technical qualifications are currently available. This diversity of options – resulting from the organic development of a market to meet the requirements of employers and learners – is potentially confusing to many. Ofqual does not restrict the market. Our role is to regulate for quality on behalf of qualification users; that includes employers, as much as it does learners. We take seriously our responsibility to help everyone understand the landscape, and we recently launched a tool that we hope will make exploration easier. We believe these tools will prove especially beneficial as the landscape changes, for example when T levels are introduced. We’ve been seeking feedback on this prototype, and thank-you to those who have already contributed – please keep it coming via analytics@ofqual.gov.uk. Chart 1: Number of qualifications certificated in England in 2016 to 2017 by type. Chart 2: Number of qualifications available in England as at 1 November 2017 by type. English for Speakers of Other Languages (ESOL) qualifications are designed to help speakers of other languages develop and improve their English skills. They are not required for visa applications. Secure English Language Test (SELT) qualifications are required for applicants applying for a number of different immigration visas. These tests must be passed with a Home Office approved SELT provider. Functional skills qualifications test applied skills in English, maths and information and communication technology (ICT). They are available in the following levels: entry 1 to 3, level 1 and level 2. Applied general qualifications are level 3 qualifications for post-16 students who want to continue their education through applied learning. These qualifications are included within Department for Education performance tables, and support entry to higher education, carrying UCAS tariff points. Tech awards are level 1 and 2 qualifications that provide 14 to 16 year olds with applied knowledge and practical skills. They are included in Department for Education performance tables. Technical certificates are level 2 qualifications that provide post-16 students with the knowledge and skills they need for skilled employment or for further technical study. They are included in Department for Education performance tables. Tech levels are level 3 qualifications that provide post-16 students with the knowledge and skills they need for skilled employment or for further technical study. They are included in Department for Education performance tables. 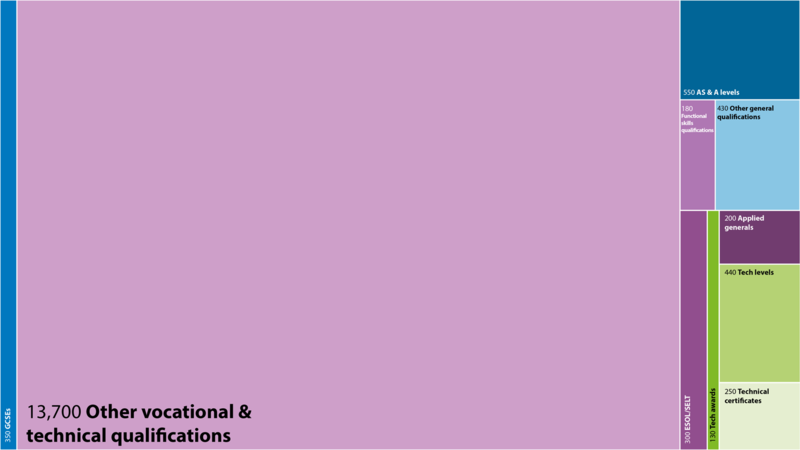 This category is based on qualifications categorised as 'other general qualifications' by awarding organisations. In some cases, these qualifications are also included amongst the aforementioned applied general, technical award, technical certificate or tech level categorisations, in which case they are counted above. This category includes all vocational and technical qualifications which do not come under any of the above categories. They span all qualification levels from entry 1 to level 8, and cover a wide variety of subjects. The data for vocational and technical qualification certifications in England between is from the academic year 2016 to 2017. Data for GCSE, AS and A level is from the summer 2017 exam series. Excellent work Lucy. Keep it up! Please read our comment and moderation policy before leaving a comment on this blog. We produce newsletters that summarise the work we do in general qualifications and in vocational qualifications. Please use the links below to subscribe.